By the time Resty was 6, she had lived in fifteen different homes, shuffled between relatives because she was constantly sick. Her mother likely passed away from HIV and they believed she had it, too. At 17, she contracted tuberculosis (TB) and recovered. A couple of years later, she was diagnosed with HIV. In the whirl of emotions, she found it difficult to adhere to her anti-retroviral treatment (ART) and, with her immune system low, she developed multi-drug resistant TB. With the physical and emotional toll of TB treatment, she started skipping her HIV treatment. At 24, she required second-line ART. The Global Fund provides Resty this treatment for free. During her illness, Resty started volunteering at local health centres and became involved in youth HIV advocacy work. Through this, Resty has taken part in her country’s Global Fund consultations for the National Strategic Plan: through the Link Up project, she helped successfully campaign for the inclusion of language on young key populations. Resty has worked with ATHENA on the Youth Declaration at the 60th Commission on the Status of Women, its #WhatWomenWant campaign and the LEARN project. 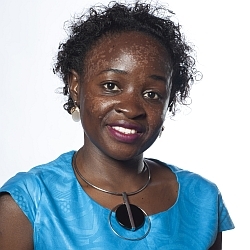 She currently works as a sexual and reproductive health and rights (SRHR) officer at the Uganda Network of Young People Living with HIV & AIDS. Resty appreciates the Global Fund’s systems of consultation and monitoring how they have worked to address structural and rights-based barriers and stigma around key populations, including young women and girls. The Global Fund has supported Uganda since 2006. It provides HIV treatment to 780,000 people, about half of all people living with HIV in Uganda, and has detected and treated 248,000 cases of tuberculosis.